Today’s cool tangle pattern, Nvelope, comes from CZT Alyss Amster of Marietta GA, “one of the Atlanta metropolitan area’s largest suburbs.” Alyss is a member of the CZT9 class and this is her first tangle on the site. 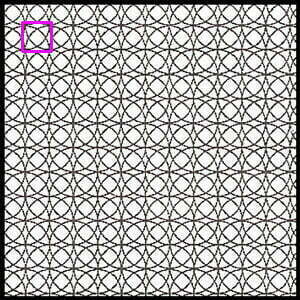 Here’s a scan from the envelope pattern that inspired this tangle, I’ve highlighted one of the grid “seeds” that forms the basis of Nvelope. Great deconstruction job, ladies! It never ceases to amaze me how such a little touch of shading can add interesting dimension to a piece and Nvelope is a great candidate for a little 3D puffery. 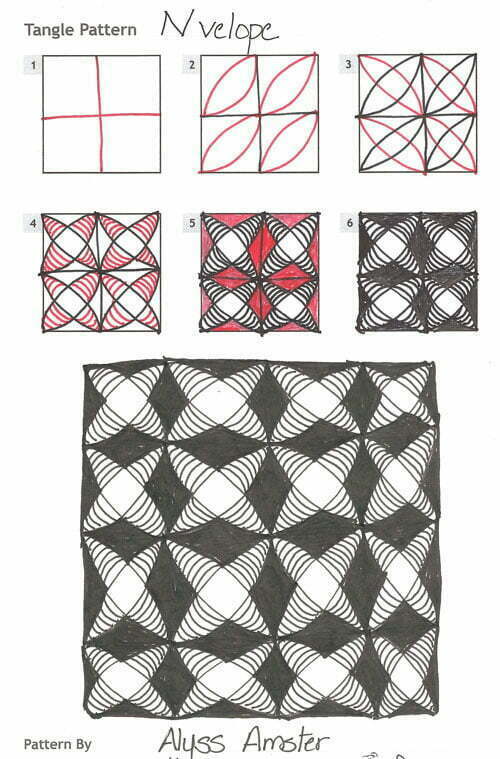 With help from her students Pat Burney, BB Crowder, Sandy Herman and Sandra Sandefor, here is Alyss’s illustration of the steps for drawing Nvelope and an example monotangle Zentangle featuring it. Check out the tag alyssa for more of Alyss’s patterns on TanglePatterns.com. Very lovely, will try it soon. I have to ask though, is the name of the tangle ‘en-VELL-up’ or ‘EN-vell-ope’? The verb or the noun? I would say it’s the noun since the original inspiration, an envelope, is a physical object. Thus, ‘EN-vell-ope’. I love this tangle, will play with it today. And I love that you are teaching a seniors group! What a lucky bunch! Ahhh… What a change a few strokes make! Fun! What a fun Tangle, I am anxious to try it! It makes me think off a soft pilllow, I just haad mt hip replaced, so soft is comforting. Thannk yoouu foor sharing! Just tried this one. Sitting the heat of an english summer it reminded me of the fan blades that i have swirling round. This is a GORGEOUS tangle, and I’ll enjoy using it. I love the patterns inside those security envelopes, but it never occurred to me to deconstruct one and turn it into a tangle! Brava! Bravissima! Good job–I know it wasn’t easy to do, but the results were well worth the effort. Thank you for that. I have just discovered this wonderful art form. I am a card maker but since I have been experimenting with all of these great tangles, my card making has come to a halt. I can’t to try this one. Thank you for sharing. I’m new to tangling and can’t wait to do some shoes and a pillow for my girls couch. They will love it. Very nice tangle. Can’t wait to try it! Thanks.